less is more: summer book // update 1.
summer book // update 1. 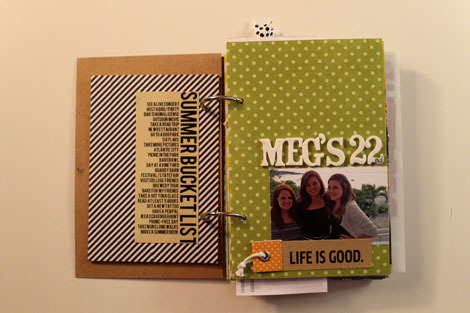 On my bucket list I included making a summer book. I haven't scrapbooked in a while, and I have truly forgotten how passionate I am about paper products and embellishments and just the whole process that is creating something with your own two hands. 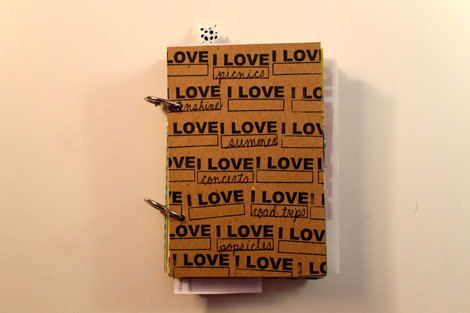 I bought a mini book from Elise Joy (not the one pictured, just one with a plain chipboard cover, which is no longer available). 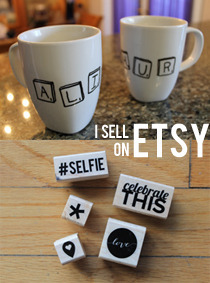 I get a lot of inspiration from her (maybe too much) and getting into her blog has made me remember what I used to love about crafting and I think that I have a lot in common with her, so it's hard not to get inspired! 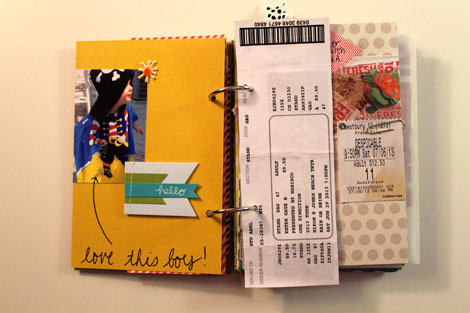 I had a hard time getting into this project because I haven't scrapbooked in such a long time, I felt like I kind of lost my groove (for about five minutes until I got started and then I was unstoppable). I couldn't fit anything together the way I wanted to and I was afraid to mess up the pages of the book, but then I just went for it and before I knew it I had documented half the summer. I am now up to date, but not all of the pages are completely finished because I need to make a trip to the craft store to get some more labels so that all of the pages don't have the same type of label for journaling. This was a plain chipboard cover, and I used elise's stamp and staz on black ink to cover it. I wrote in a few things I love about summer that have some kind of appearance in this book. I skipped decorating the back of the cover and the first page for now, but covered the back of that page with washi tape and included my summer bucket list image. 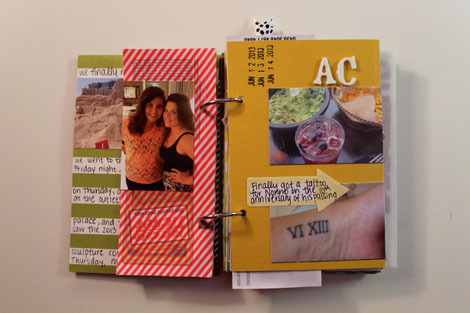 The right page is a picture of me and my two best friends, Alyssa and Meagan on Meg's 22nd birthday. I forgot that I wanted to timestamp that page, but I did use american crafts thickers and a recollections embellishment. This spread was all about Atlantic City, which was on my bucket list. 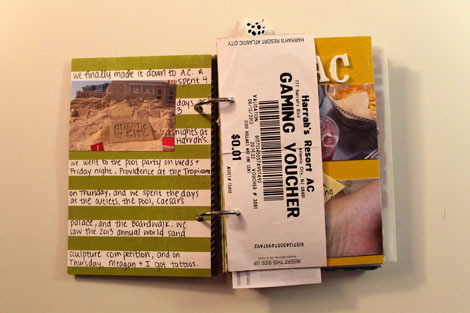 I included my one cent gaming voucher just for giggles, some journaling on the striped page, and a couple of my favorite pictures from the trip. I used washi tape and thickers again, a smash date stamp, and arrow post its from target for journaling. In this spread the left page is a picture of Max in his adorable hooded pirate towel from a day we played with his splash pool. 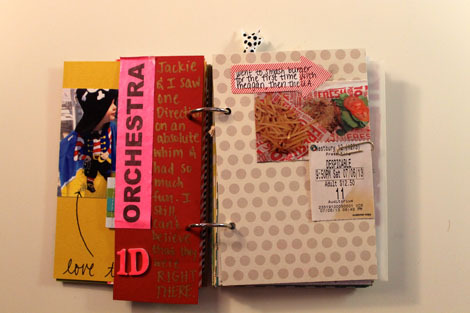 I used a recollections sticker here too, and between the two pages I put my ticket from the One Direction concert with some journaling and the wrist band we got on the back. On the right I put a picture of my dinner from smash burger and a movie ticket from a date night with my friend Meagan. And that's what is pretty much finished so far! I am having so much fun putting this together and I really think my passion for scrapbooking and paper projects is making a vicious comeback. 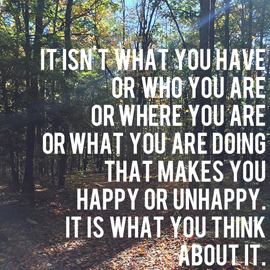 I'm really excited about that.